I’m totally smitten with the Moroccan kitchen! 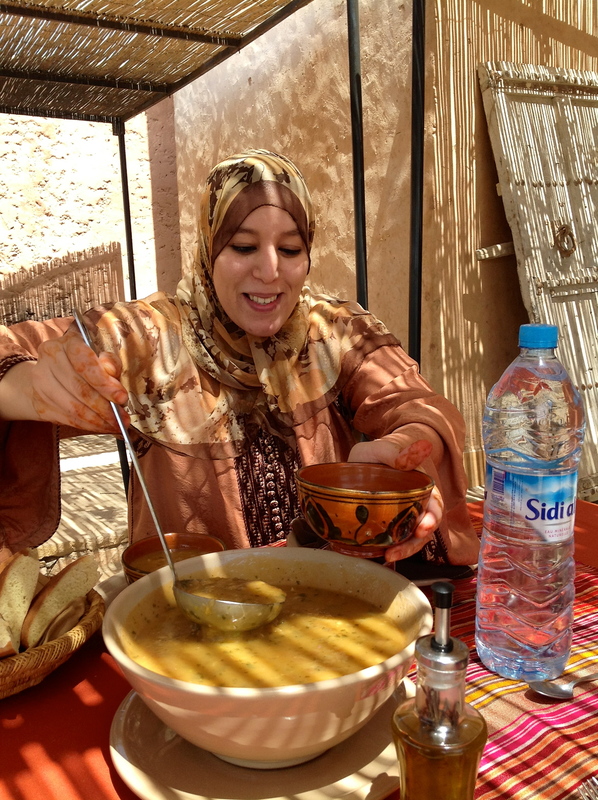 After having travelled through Morocco’s mountains, desert, valleys and coast, been welcomed by amazing people, and tasted so many delicious dishes and soups, I’m happy I can finally share some great new recipes. Today I like to start with Harira, one of Morocco’s most famous soup recipes. 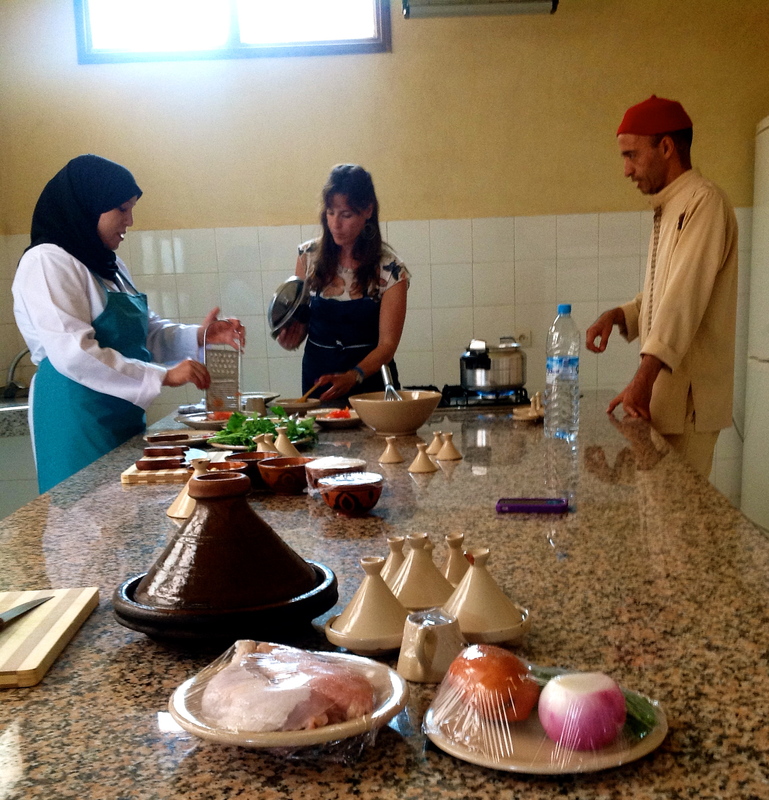 To master this soup, I did a cooking class at Atlas Kasbah, an amazing ecolodge in the region of Agadir. Hayat, the Berber chef, and Mbark gave me a great class and if you ever have the opportunity please, go and visit Hassan’s beautiful Kasbah. Harira is traditionally served in nearly all households to break the fast at sunset during the month of Ramadan. However, a lot of families also enjoy this hearty soup year-round. The soup requires some preparation and cooking time but if you have a pressure cooker you will be able to speed up the process. Wash the chickpeas, fava beans and lentils and soak overnight. Rinse well before using the next day. Pick all the leaves of the parsley and coriander (cilantro) and chop finely. Chop celery stalks and leaves finely. Grate the tomato and onion finely and dice the meat into 1 inch cubes. Heat the tablespoons of vegetable oil in a pressure cooker. If you don’t have a pressure cooker please, read the stockpot method below for adjusted cooking time and water. Cook the meat for a few minutes until brown on all sides. Stir in the grated onion and tomato. Add all the celery and only half of the parsley and coriander. Stir in the tomato paste, chickpeas, lentils, fava beans, salt, pepper and all other spices. Add 2L/8 cups of water and close the pressure cooker so it can work its magic! Cook for 45 minutes on medium heat and remove from heat and carefully release the pressure. Stir in the rice and cook for another 30 minutes with pressure. While the soup is cooking mix 1 cup of flour with 2 cups of warm water. Whisk till all flour is dissolved and it has a smooth texture. Remove lit from pressure cooker, pour the flour mixture into the boiling soup. Make sure you keep stirring continuously while the soup is thickening. The soup has a velvety consistency but not over thick. You can make it as thick or thin as you like by not adding all the flour mixture or adding some more water. Cook the soup for another 15 minutes; stir in the left over half of the coriander and parsley and season to taste. Serve with flatbread, a wedge of lemon and dates on the side, an amazing combination. Double the suggested cooking times and add approx. 4 cups of warm water after the first hour of cooking.